Pioneers of punk -The New York Dolls will release their third album since reforming in 2004. The new album is called, “Dancing Backward in High Heels” and will be released on March 15th. 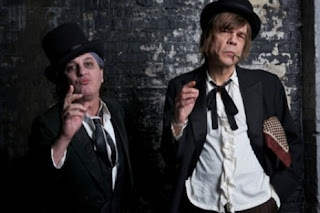 Original Dolls frontman- David Johansen and guitarist Sylvain Sylvain are the only surviving members of the group. Blondies ex guitarist Frank Infante and bass player Jason Hill from Louis XIV are also featured on the album. On July 6th The New York Dolls will be supporting Motley Crue and Poison at the St. Pete Times Forum. (According to the Dolls- Myspace page) You can purchase tickets here when available. The Foo Fighters will release their latest hard- rockin’ masterpiece “Wasting Light” on April 12th. It’s their most recent album since 2007. The albums first official single called “Rope” has already generated rave reviews by their fans. The Foo Fighters will perform live at the Hangout Music Festival- in Gulf Shores, Alabama on May 21st and at the Sasquatch! Music Festival on May 27th in George, Washington -state before starting their European tour. Soundgarden will release "Live on I-5" on March 22nd. It’s the bands first- ever live album from their 1996 tour. The bands hope is to create a brand new Soundgarden album this year. Meanwhle, Chris Cornell will embark on his sold out- 28 date -solo acoustic tour on March 25th thru May 6th. Whitesnake’s newest is their- 11th studio album called “Forevermore” and will be released on March 25th. The ‘snake’ will hit the road to support their latest release for a world-wide tour. Journey’s “Eclipse” album will be released on May 24th. Journey will launch the “Eclipse Tour” with Foreigner and Night Ranger. They’ll arrive in Tampa on September 17th at the 1-800 Ask-Gary Amphitheatre. Look for tickets here. Recently released albums earlier this month were R.E.M.’s 15th studio album, "Collapse Into Now." Patti Smith and Eddie Vedder were among the guest artist. And Asia's "Spirit in the Night", Live in Cambridge 2009. It's the reformation of Steve Howe,Carl Palmer,Geoff Downes and John Wetton. The 2011 Hippiefest lineup has been announced. This year’s flower power event will feature Dave Mason (“Only You Know and I Know,” “We Just Disagree”) Grand Funk’s Mark Farner (“I’m Your Captain,” “We’re an American Band”) Rick Derringer (“Rock and Roll Hoochie Koo”) Felix Cavaliere’s Rascals ("Groovin'," "A Beautiful Morning") and Gary Wright (“Dream Weaver”). Look out for a peace-lovin’ sit-in at Clearwater’s Ruth Eckerd Hall on Saturday August 27th. And there’s the 2011 Happy Together Tour starring Flo & Eddie of The Turtles, The Association, The Grass Roots, The Buckinghams and Mark Lindsay former frontman of Paul Revere and The Raiders. And the concert will also be featured at Ruth Eckerd Hall in Clearwater on July 19th. Check back here for tickets.